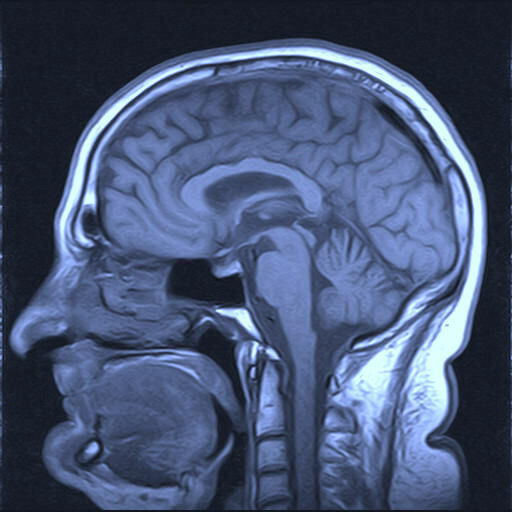 This post is the second in a brief series on the basic arguments for and against mind-body physicalism. The series follows the discussion in William Jaworski’s book Philosophy of Mind: a Comprehensive Introduction . This post is subject to all the caveats and qualifications mentioned in the first post. To recap a little, the mind-body physicalist is, at the most abstract level, committed to the view that mental reality is ultimately identical to, supervenient upon, or realized by the entities posited in fundamental physics. As we saw the last day, one argument for this thesis is the argument from past explanatory success: physicalist explanations have been successful in the past so they are likely to be successful in the future. 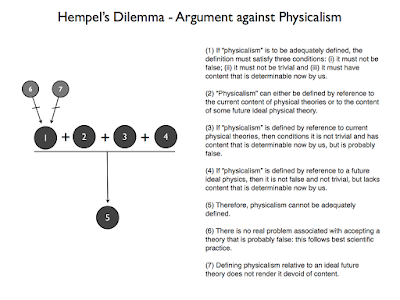 In today’s post we’re going to consider a classic objection to physicalism: Hempel’s dilemma. This is, in fact, a specific instance of a broader problem in the philosophy of science and so has ramifications that extend beyond the mind-body problem. 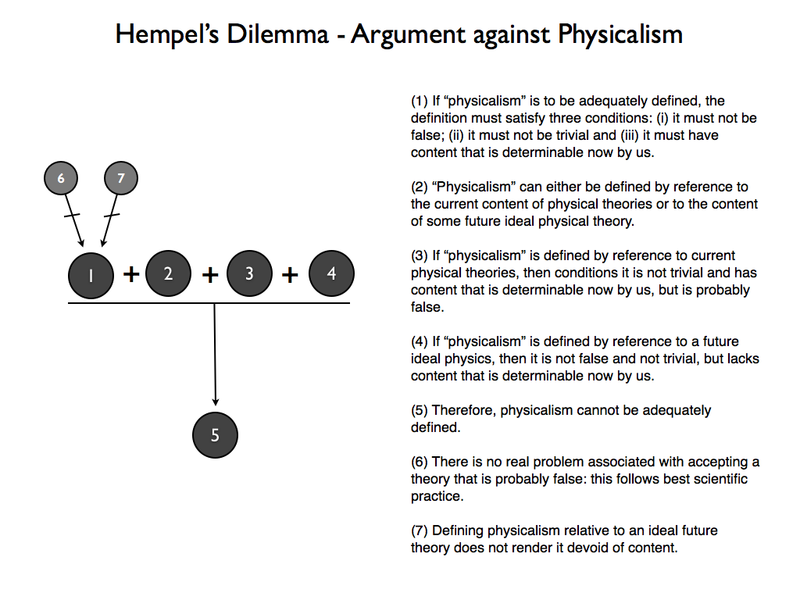 For the purposes of this presentation, I am going to reach beyond the confines of Jaworski’s book and look instead to (part of) the discussion of Hempel’s dilemma in Andrew Melnyk’s book A Physicalist Manifesto . I do so because - solid and all as Jaworski’s presentation is - Melnyk is slightly clearer about both the constraints facing the physicalist that give rise to the dilemma, as well as the subsequent implications of the dilemma. Indeed, Melnyk has a gift for clarity, rigour (and, indeed, humility) that is on display throughout his book. This gift makes his probably the best overall defence of physicalism on the market. (i) It cannot be obviously false : This seems like a straightforward constraint. Anyone who commits themselves to a thesis cannot also be committed to its falsity, can they? (ii) It cannot be analytic or trivial : This seems legitimate. For example, if physicalism were simply defined as the thesis that “whatever exists is physical” it would be trivially true. It would have no possibility of being false and would say nothing interesting about the fundamental nature of reality (including mental reality). (iii) It must have some content that is determinable now by us: This, also, seems legitimate. We cannot, it would seem, accept a theory that is devoid of currently determinable content because such a theory would have two unwelcome implications. First, it would not automatically exclude many things that we now take to be non-physical. And second, it would prevent us from taking currently available scientific evidence as evidence for or against physicalism. (1) If “physicalism” is to be an adequate theory, it’s definition must satisfy three conditions: (i) it must not be false; (ii) it must not be trivial and (iii) it must have content that is determinable now by us. (2) “Physicalism” can either be defined by reference to the current content of physical theories or to the content of some future ideal physical theory. (3) If “physicalism” is defined by reference to current physical theories, then conditions (ii) and (iii) are met but (i) is not. (4) If “physicalism” is defined by reference to a future ideal physics, then conditions (i) and (ii) are met but (iii) is not. (5) Therefore, physicalism is not an adequate theory. Now you may be wondering: what reason do we have to accept (3) and (4)? The answer is the following. We have reason to accept (3) because past experience suggests that physical theories are constantly being refined, replaced and superseded by better physical theories. So if past experience is any guide - and who are we to assume otherwise? - the content of current physical theories is almost certainly false. We have reason to accept (4) on the grounds that a future ideal physics must, necessarily, have content that is not now determinable by us, otherwise we would already be in possession of the ideal theory. The argument contains within in it a dilemma, usually attributed to Carl Hempel: either the physicalist accepts a theory that is almost certainly false; or he accepts a theory that has no content; he can’t do both. I’ll switch back to Jaworski’s book now. He notes that, as with all dilemmas of this sort, there are various strategies open to the physicalist in response. They can grasp one or other of the horns and say that the implications are not as dire as they first appear; or they can deny one of the premises that gives rise to the dilemma, thereby slipping between its horns. Jaworski notes that the second strategy is - perhaps surprisingly - not all that popular (although Melnyk could actually be interpreted as opting for that approach). Instead, most defenders of physicalism have grasped one of the horns. For instance, there are those who say that accepting a theory, even though it is likely to be proved false in the future, is not that big a deal (again, Melnyk could be interpreted as taking this approach). They take their inspiration from the fact that this is simply par for the course in physics. One defends whatever theory seems most likely to be true at a particular moment in time. This is how we progress toward better theories. There’s no real problem here. (6) There is no real problem associated with accepting a theory that is probably false: this follows best scientific practice. Alternatively, there are those who accept that physicalism must be defined relative to an ideal physics. They tend to deny that a commitment to physicalism in the here and now lacks content. They’ll say current physics provides some clue as to the content of future physics. They justify this claim by pointing out that although physical theories have been refined and replaced over the past 400 years or so, the older theories are rarely deemed to be completely false. Some of the content from those theories carries over. Thus, even if physics hasn’t bottomed-out at the fundamental level of reality yet, we know enough now to say that mental entities will not exist at that fundamental level. They will, instead, be made up of components from that level. (7) Defining physicalism relative to an ideal future theory does not render it devoid of content. As I see it, both (6) and (7) function as denials of (1). That is, they supply reason for thinking that a theory which fails to meet those three conditions can still be adequate. This is reflected in the diagram below. Okay that’s it for now. In the next post we’ll consider the famous knowledge argument against physicalism. Another thought provoking series. Beautiful! 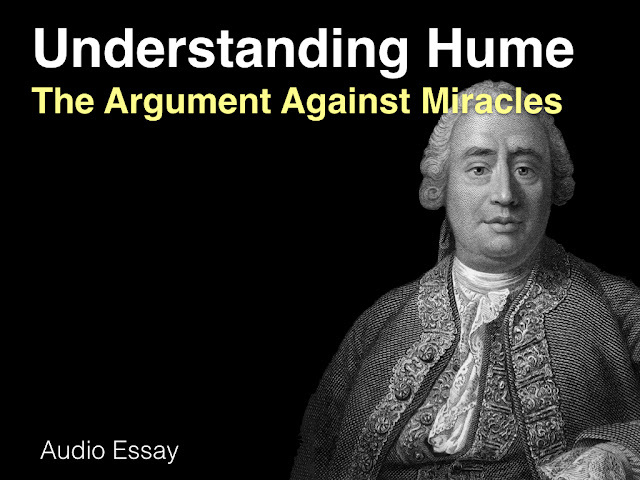 A third way to undermine the argument is to attack premise (2). That is my preference. I define "Physicalism" based on certain broad properties of reality. Current scientific theories provide me with good reasons to believe that reality indeed has these features - but they don't define what physicalism is. Specifically, I define "Physicalism" as the the idea that all properties are public and objective. They interact with other properties (they are public), and these interactions can be described in precise terms irrespective of the thing they interact with (they are "objective"); it is the combination of these two qualities that allows us to do science. In contrast, a pure spirit would (supposedly) not necessarily interact with matter, and would lack a precise, mathematical, objective description. Note that this is not naturalism, merely physicalism. Naturalism requires the additional assumption of uniformity: that things are made up of the same fundamental particles, for example. My definition of physicalism likewise doesn't exclude substance dualism, as the "thinking stuff" interacts with the "inanimate stuff"; I consider that a virtue - under substance dualism, the thinking-stuff is just more "stuff", perhaps a little hard to access but just as much a part of the "physics" of the world as is inanimate stuff. Finally, I'd add that my definition doesn't rule out property dualism, as properties can be public and objective yet also have a subjective aspect of "how it feels like"; this is, again, a virtue for me as I am a property dualist. At any rate, even if you don't accept my definition, the overall strategy of denying 2 appears wise to me. I see Hempel's dilemma as analogous to arguing over Sphericism - the idea that the Earth is (approximately) round. Either you base Sphericism on current science, or on ideal science.... But of course, we base Sphericism on our belief that the Earth is round, and only support this belief with (current) science.